(SPOILERS) It’s rare that a critical lambasting is completely unwarranted, and by and large I was on board with the barbs thrown at Batman V Superman: Dawn of Justice. 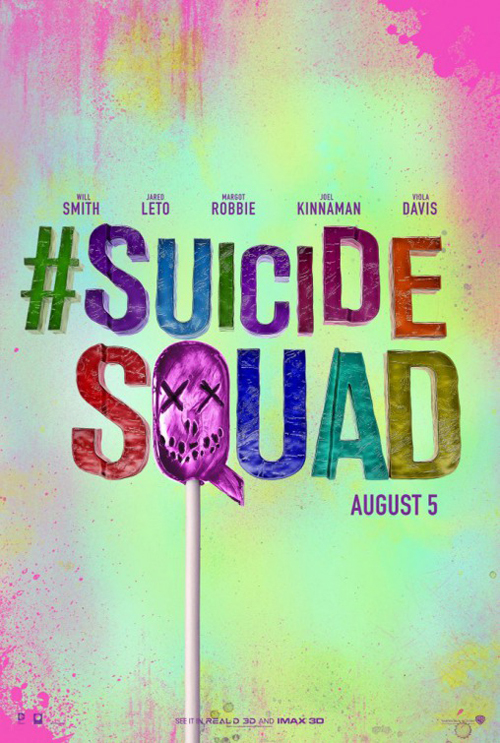 Suicide Squad is a slightly different bag, though. As expected, it’s an incredibly inelegant, unkempt movie, even more so than those technicolour yawns masquerading as poster art, but not as unkempt as some of those tinkered-with bombs of old, where the editing becomes a virtual non sequiturs (such as the original 1998 The Avengers – also featuring a character in a bear costume – or Highlander II: The Quickening). Part of this is simply down to David Ayer being an incredibly inelegant, unkempt moviemaker (such that you can almost believe his protestations that this really is his director’s cut), but it’s also evidence of a relatively modest production in conception being force-fed studio diktats that come dangerously close to overwhelming its positives. Did I like it? Yes, up to around the point where, firmly embedded in Midway City, the (Deadshot-monickered) Suicide Squad, a DC Dirty Half Dozen, see Amanda Waller (Viola Davis) off in her helicopter and it goes plummeting to the ground. There are still about another 50 minutes to go after this, unfortunately (at least, it seemed like it). From there the movie teeters into the slumped posture of just another increasingly generic, effects-crazed, all-out-stuporous blockbuster: predominately dull, basically, or working on standard suit notes of how these sorts of movies should play out. The big confrontation is bizarrely similar to the end of Ghostbusters (the original) in terms of setting, while its failed attempts at heroism parallel Ghostbusters (the reboot); of the latter, neither movie should have been attempting to portray the victorious acts of its protagonists sincerely in the first place. Ayer, during the last half of the film, undoes most of the hard work he’s done establishing an irreverent, dismissive and mocking attitude towards such righteous behaviour. The result is, he’s increasingly grinding metal with his characters and cast. The excuse for taking down the bad guys (guy and girl) is that the squad have nothing better to do, which at least isn’t exactly fine and upstanding, but neither is it remotely inspired. It would be acceptable if that was as far as it went, but the contingent attempts to inject humanity into this crew, after all that we’ve been told and shown, feel like a betrayal. Sure, El Diablo is strictly following his established arc, so he can be excused, and Jay Hernandez portrays a thinly-sketched caricature of a guilt-wracked man with just enough soulfulness that we buy into his state of mind. Will Smith as Deadshot (Floyd Lawton) is a different matter. Deadshot is the other character with a moral centre, and even though he gets a (rather good) line about not falling in love because he wouldn’t be the kind of guy who kills people for a living if he did (to which Harley Quinn diagnoses his being another textbook sociopath), his entire motivation is mooning over his doe-eyed sprog. It’s reasonable to strike this balance up to a point, and I’d even say I quite like Ayer and Smith are doing to a degree. The problem is, it becomes repetitive, to the extent that overweening star power must be blamed for giving Deadshot too much substance for the purposes of portraying a stone-cold killer while simultaneously not enough substance to justify the spotlight on what would, sans Big Willie Style, be just another bad guy. Smith has charisma aplenty, but it isn’t in service of a sufficiently interesting character, ultimately. The real tester here is the scene where Floyd mows down legions of multi-eyed zombies (who reminded me ever-so-slightly of less blob-like Gel Guards in Doctor Who’s The Three Doctors, only less inspired; but then, inhabiting David Ayer’s dream space would, I don’t doubt, be very much less than inspiring). It should be an iconic moment of an anti-heroism at work, but it just kind of sits there, not because it’s badly shot or edited, but because we aren’t sufficiently behind Deadshot to award him such status. So, when it reaches the point of the Ghostbusters confrontation, where the gang all get their moments, and all get gifted their fantasy reality (well, three of them anyway, which I will come to in a bit), it reaches overkill. I didn’t mind the three introductions to Smith that have been noted in some reviews, as I enjoyed each of them, but by this point in the proceedings, what is an effective-enough idea in concept merely elicits an “Oh, get on with it!” (with the caveat that El Diablo’s involvement is the only remotely engaging part). I was similarly unmoved by Harley Quinn trumping the Enchantress (Carla Delevingne) with some heart-ripping, stabbing action, and that’s despite Margot Robbie’s unstoppable force throughout the movie, be it understandably stopping her male entourage dead when she dons her tighter-than-tight short shorts, or reeling off frequently less-than-devastatingly-witty quips. Smith does his best with average material, whereas Robbie does brilliantly with often decent material. Until the bar scene, at any rate. There’s some peculiar stuff in her flashbacks that doesn’t really compute (exactly what kind of acid is it that she and the Joker topple into; a very light facial peel that simultaneously has a devastating impact on fabrics? But I’ll let that go as expressionistic, even if nothing else in the movie supports such a reading), but Harley Quinn only just about escapes with credibility intact when she’s required to become emotionally engaged with her fellows (and thus not so fruit-loopy after all; everyone drops into standard-issue responses when the scene requires it, basically). I know it’s inevitable with this kind of thing that you have to have some kind of empathy between the empathy-free, to support basic interaction, but did it have to be quite as ineptly espoused as in that bar scene? Suicide Squad walk into a bar (and guess who has to play bar lady?) They get all mushy. Did I miss the punchline? And even the Japanese chick with the ghost sword (Katana, played by Karen Fukuhara; WB also missed something, a trick in not rewriting her as Chinese, and thus a release slot in a potentially highly-lucrative region), not actually part of the criminal fraternity, but a few hours earlier wholly dedicated to the service of Rick Flagg, leaves her boss on the street to his moping. I wouldn’t want her to have my back in a tight spot. Or perhaps she just really needed a drink? Or had an aversion to getting wet? Anyway, the excuse for indulgent backstory(ies) works much less well here than in Ayer’s earlier, punk-affected approach. Particularly when Flagg gets on board. So, while there are some confident moments after this, notably Harley’s brief escape courtesy of the Joker, the general feeling I had was that Ayer had soured his milk, attempting to inject to much misplaced soulfulness into the proceedings. He might at least have been balanced, if he really had to have Harley, Deadshot and El Diablo display their bleeding (of fiery bleeding) hearts. To wit, Jai Courtney’s Boomerang. I don’t have much to say about Killer Croc (Adewale Akinnuoye-Agbaje), since as far as I can recall he doesn’t have any backstory – he certainly doesn’t have a fantasy moment (that might have been fun, or perhaps a bit too bestial), and his swimming skills aren’t wholly impressive – but Captain Boomerang, and Courtney himself, surprised me by being absolutely terrific... When he was written to be a knuckle-headed moron, whose special skill appears to be swigging lager, wearing a tracksuit, and tossing off a surprisingly hi-tech boomerang, that is. When he’s being an idiot, in a kind of awesomely tragic way, I’d give him the honour of being near-equal to Harley Quinn (whom he mutton-headedly attempts to ask out at one point) for the movie’s top character, but there’s far too much tempering of that dissolute flame. Increasingly, as the picture wears on, Boomerang’s given lines alluding to how crazy he, or everyone else, is or conciliatory gestures towards his compatriots suggesting he isn’t really that nuts, or even that stupid, and that leads to a feeling it’s all an act. Which is disappointing. The ideal would have been for Ayer to undercut the trio of fantasies with Boomerang’s very own utopic vision, romping through a field astride a plush pink unicorn, like a deranged outtake from Josie and the Pussycats (not that that movie itself isn’t deranged and underrated). Alas, by that point Ayer seems to have forgotten all about Boomerang’s cuddly toy fixation (he doesn’t even play Roachford’s Cuddly Toy in a scene where the Captain rescues his beloved) and with it launched into neutering his own movie. It doesn’t help the back half of the movie that the villains are so so-so either, of course (or that there’s little sense of trajectory or build-up because the threat they pose is insufficiently defined). Delevingne is quite impressively unsettling in her early incantatory scenes (I love the summons effect of her hand being met by an inverted doppelhander, but that’s as visually seductive as her dark arts are), but her brother Incubus is a soporific whirlwind of substandard CGI once he’s unleashed, the kind of thing that looked lousy in the Mummy movies a decade and a half ago and is thus even less so now. By the time she’s prettied-up for her full witch-on, the most alarming thing about the Enchantress is Delevingne’s unfettered eyebrows. Added to which, nothing about the siblings’ plan or conjurings has anything in the way of suspense or dread (particularly when we cut to scenes of global devastation). It’s a shame, as their entering the afflicted city armed and primed with lethal implants is an effective set up of the kind only a good Escape from New York rip-off can be. And Viola Davis makes for an effectively unflinching Lee van Cleef. Waller is one-note, sure, but Davis can run with it and make it count. Old Joel Kinnaman is much less successful with squad leader Flagg (he really doesn’t have much luck with movie roles, so it’s lucky he keeps getting cast). He fails to make Rick sympathetic, interesting or likable, and the incessant alpha-male arguments with Deadshot grow tiresome very quickly, despite the occasional decent line (“You’re just a serial killer who takes credit cards”). The first half, though. It’s not as if it’s in any way perfect. Ayer uses music on the soundtrack in such an elementary way, you’d be forgiven for thinking him a novice. He picks classic tunes, sure, but do you put only obvious crowd-pleasers on a mix tape, so there’s no variation in mood or tempo? If every scene is backed by an established classic, every scene loses its lustre, diffusing the sought-after coolness. Tarantino can get away with it because his tastes are so eclectic. You leave his movies going, “What was that song?” (well, most of the time; admittedly, I was less than enamoured by his wholesale lifting of The Thing in The Hateful Eight), whereas here the response is “Oh look, Ayer’s picked another really literal, really good tune that’s been used in movies dozens of times by this point”. That aside, the sheer brashness and swagger of the introductory passages had me onside. There’s an energy and attitude here simply absent from the dramatically forlorn BvS (when Wonder Woman is off-screen at any rate). Affleck is effectively used in the apprehension of Deadshot and Harley (more so with Harley – Batffleck gets a solid laugh for hitting a girl, audiences always love that – as I wasn’t really feeling the Deadshot confrontation) and even the Flash taking down Boomerang (who couldn’t take down Boomerang? The only thing missing was a scene where he trips over his shoelaces) didn’t feel gratuitously continuity-fied. I’m not altogether sold on Affleck as Batman; he leaves me a touch indifferent, because Affleck generally leaves me a touch indifferent, but he’s better as the Caped Crusader than in his mid-credits Bruce Wayne appearance. I was also amused by the expiration of Slipknot, and wondered if it was a sort-of homage to Executive Decision, since Adam Beach bears a passing resemblance to a svelter Steven Seagal. I didn’t have especially high expectations for Suicide Squad, so while I wouldn’t say they were exceeded, I at least didn’t go away disappointed. I don’t think the kind of onset antics encouraged by Ayer are to be respected, mostly because the movies he tends to make are so far from being works of art that his “method” approach comes across as juvenile play directing/acting (and I know he has a military background, but all I can say is, it’s a shame it didn’t instil more maturity, if he thinks he’s genuinely achieving something meaningful with this kind of movie). But more power to them, I guess, if his cast feel like they’re back in drama school heaven. Certainly Smith, freed from the shackles of Scientology and looking for something else to believe in, seems enamoured (they’ve got that Netflix movie coming up, which on paper sounds very iffy, thus ideal for Ayer). The movie doesn’t make me want to send dead rats, or used condoms, to Warner Bros, so on that level it should be seen as something of a success. But then, I’m not one of the DC faithful. Even if its destination is disappointingly familiar, Suicide Squad spends a good amount of time behaving refreshingly differently, which sets it apart from the current superhero crop (and I include Deadpool in that, which all-too quickly becomes reliant on flogging its dead meta-horse). I’ve hardly mentioned the Gruffalo Joker, have I? Leto (a mere seven years between him and the age Nicholson played the definitive big screen Joker, which makes you think) seems pissed off that he’s hardly in it, which has to be a reason to congratulate Ayer, if nothing else. I suspect the director had lofty ideas about making the Joker Lector-esque in his sparing use, so as heighten his impact, but in a movie as choppy as this that kind of thinking is never going to pan out. Either that or he thought the performance was terrible and was salvaging it, or thought Leto was a jerk (heaven forfend) and wanted to punish him. As it stands, though, I thought the Jared was fine. He can’t hope to match Robbie’s performance, so there’s an imbalance there as it really needs gloriously demented chemistry, and he never really shows the Joker as a bona fide, intimidating lunatic, or even just a mildly amusing lunatic, but visually the Gruffalo conceit rather works in terms of Ayer’s overall tone. I’m not yearning to see what of the Jared’s performance ended up on the cutting room floor (a movie’s worth of material, it seems), but he doesn’t sully the Joker’s legacy either. Now, the Captain Boomerang cut of Suicide Squad; that I’d like to see. 90 minutes of Jai and his pink unicorn would be Jai Bless bliss.